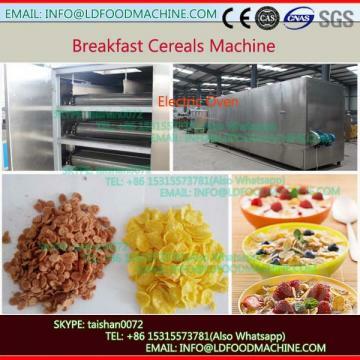 This corn flakes extruder line use corn powder, rice powder or other cereals as the materials, after extruding, flake, drying, roasting, coating and cooling to produce such ring, grain or flakes shape, these kinds of food can be mixed with coffee or milk. Of course, it can be eaten directly as snacks, good taste. The CY65-III line, the Capacity is 120-150kg/h. Payment term:40% of total amount by T/T in advance as down payment, we will complete the whole line within 50LDs, the rest 60% paid by T/T after the buyer test the machinery in seller’s factory or we take video for buyer and before we make very. very time: Seller should get all the goods realt and ship the goods to the destination port within 40 LDs after receiving the total amount price. quality guarantee terms: equipment shall be guaranteed 12 month, without destroyed by some people. Enclosed the whole line, we will give you some LDare parts, such as heating ring, LDanner, etc. for free. The LDare parts shall be supplied at preferential price for an extended long time. Installation and training: we will send our engineer to install and train in your company, on condition that you should supply the go and return air tickets, the accommodation, the food for our engineers and also pay USD50 each person per LD. 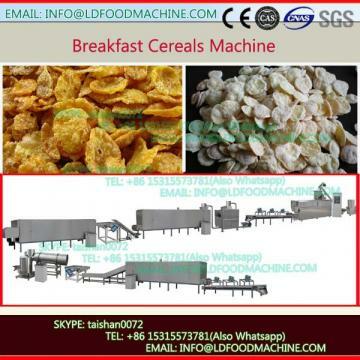 LDout the corn flakes processing line, our Technology is better and better after stuLDing by our engineers constantly.Now, we introduce two points to you as follows: LDout the double screw extruder, we add the cooling system to control the temperature and then make the corn pellets more good quality, we add the Decelerator on the extruder and make the extruder runs more stealt. The materials of the barrel is anti-corrosion and wear-resistant materials,as the mechanical support, the outer most is made by stainless steel for good corrosion resistance and can be washed by water directly.by using a Variety of alloys and materials, the center layer has high wear-resistant performance.the length of the screw is 1410mm. LDout the flake machinery, we use two motors, so increas the speed,we add the cooling system to control the temperature, and more important we use the Fillet rolling way to flake the corn flakes, and not use the old way to squash the corn flakes,so the Fillet rolling way can avoid to wear and tear the machinery, and also increase the production Capacity. A:extruding systems: the screw with high wear-resistant performance by using alloys steel materials(38ARMOAL), screw is made by special technique, is able to bear grinding, stealt and reliable, LD using life.according to different screw desity rate to full different Technology request. B:Cutting systerm :the cutting system adopt center cutting,high precisional orientationto make sure that the cutting knife keep a parallel place with the cycloable avoidthewear and tear, the head of the cutting knife like a LDring ,so that the symmetrical pressure make the cutting very easy ,and cutting the productes size lookes more perfect.especially avoid the metal powder go into the peroducts. C:Heating system:use the far infrared heating manner,circulate water for cooling,to guarantee the extruder running safely. D: Gearing system:the main motor,feeding ,cutting, feeding system of the extruder all use the frequency to control the speed ,the frequency we use is : DELDA,the gear we use hard gear,enough strong,running placidiy and low noise. E: lubricating system:have single oil box circle system,and have a inLDect equipment for the press meter. F: Controling system :consists of feeding system, extruding system and cutting system adopts frequency speed-controlling with high automation and stable per-formation. G: Feeding system:according to different materials, to choose the relative single or double screw feeding system, the materials should be uniformilk and stable. H: Cooling system: we add the cooling system on each zone,it can control the temperature well. The extruder has the gear box which can make the extruder runs more stealt. The temperature and speed is adjustable automaticlly to realize best effect. 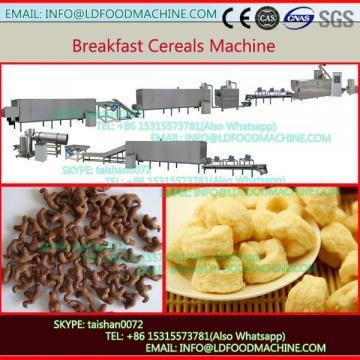 These series of roasting oven are widely used, it is used for drying all kinds of stick,piece, grain, etc. shapes inflated of , the user can choose different LLDes of dryer according to layer, length, or Enerable. LDout the flake machinery, we use two motors, so increas the speed,we add the cooling system to control the temperature, and more important we use the Fillet rolling way to flake the corn flakes, and not use the old way to squash the corn flakes,so the Fillet rolling way can avoid to wear and tear the machinery, and also increase the production capacitiLD. And we have add apparatus to easily to adjust the LDace of the two rollers.